Dr. Jim Zeliff grew up in northern New Hampshire where his interests were skiing and trail riding. He graduated from Purdue University with a bachelor’s degree in Biology in 1983 and a Doctor of Veterinary Medicine in 1988. After graduation he completed an internship at Belmont Racetrack in New York. He came to western Pennsylvania in 1989 and founded Allegheny Equine in 1992. His primary interests are equine reproduction, sports medicine, lameness diagnosis and practice management. Jim and his wife Tammy have a son, Dustin and two daughters, Ali and Haley. Dr. Nadine Salomon joined Allegheny Equine Associates in May, 2011. Dr. Salomon grew up in Armstrong County and completed her Animal Bioscience Degree at Pennsylvania State University. She then went on to earn her Veterinary Medical Degree at the University of Pennsylvania in 2006. After vet school, she completed a 1-year internship at Anoka Equine Veterinary Services, a full service equine practice and referral center, where she was exposed to all aspects of equine veterinary medicine. Dr. Salomon remained in Minnesota working for Anoka Equine for 4 years prior to returning to Western PA. Dr. Salomon developed her interests in general and internal medicine, lameness and reproduction. In 2018, Dr. Salomon completed a 5 month program with Healing Oasis Wellness Center to become certified in veterinary spinal manipulation therapy. In her spare time, she enjoys spending time with her family and pets, cooking, hiking, photography, and riding her horse. 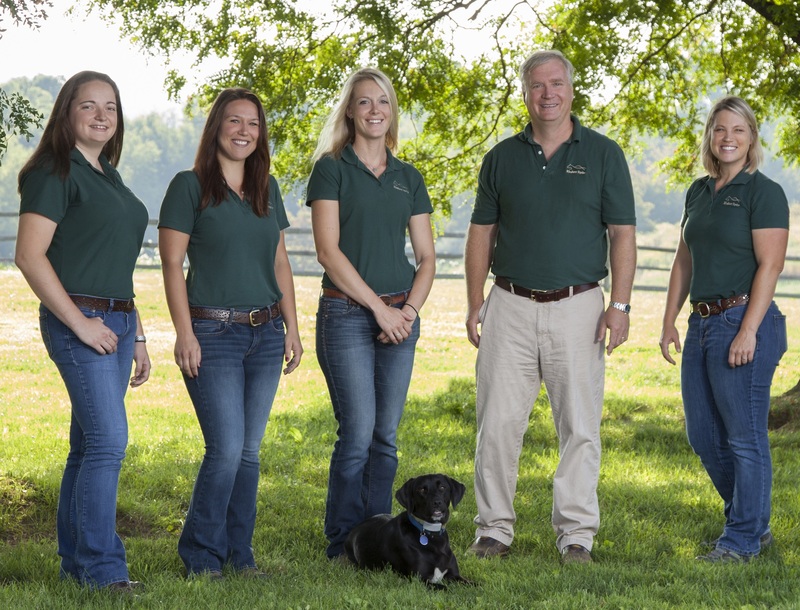 Dr. Dara Brown joined Allegheny Equine in 2013. After completing a 5 month course through Options for Animals in 2014, Dr. Brown became certified in equine chiropractic by the International Veterinary Chiropractic Association. She also attended the Chi Institute and became certified in equine veterinary acupuncture in 2014. In 2016, Dr. Brown became a certified equine rehabilitation practitioner through the University of Tennessee. Dr. Brown is originally from western New York, where she grew up riding and showing Arabian horses at both the local and regional level. She was active in the local horse community and was a 4-H club leader for several years. Dr. Brown received her Bachelor’s degree in genetics from the University of Rochester in 2006, followed by a Master’s degree in molecular biology from Carnegie Mellon University in 2008. Trading in her microscope for a stethoscope, Dr. Brown attended the University of Pennsylvania School of Veterinary Medicine and completed an internship at Blue Ridge Equine Clinic in Virginia. In her free time, Dr. Brown enjoys spending time with her son and husband, running, and cheering on the Steelers. Dr. Alexis Baney joined Allegheny Equine in 2015. She grew up in central Pennsylvania and was introduced to horses by her grandfather, who had her riding well before she was able to walk. She participated in 4-H, the local hunter circuit and had a passion for jumping. Dr. Baney received her veterinary degree from Ross University and completed her clinical year at Oklahoma State. After veterinary school, she traveled to Florida to complete a 1 year internship at Brandon Equine Medical Center, a full service equine ambulatory practice and referral center. Dr. Baney’s professional interests are lameness diagnosis, ultrasound, ambulatory/preventative medicine and dentistry. Her assistant, Ren, a black English Lab accompanies her on all her calls! In her spare time, Dr. Baney enjoys riding her horse Prince, a retired Thoroughbred race horse, traveling, hiking and cooking..
Dr. Margaret Bojko joined Allegheny Equine in 2016 after graduating with her Doctorate of Veterinary Medicine from the University of Illinois. Originally from a suburb of Chicago, IL, she started riding Saddlebreds at a young age before transitioning to the stock horse world of barrel racing and working cows. Dr. Bojko attended the University of Illinois in Urbana, IL for her undergraduate studies, where she earned her Bachelor of Sciences in Animal Science, and was a member and coach of the western equestrian team. Throughout her studies in veterinary school she focused much of her time on reproductive physiology of all species especially the horse. While in Illinois she devoted much of her time to local animal rescues by fostering dogs and rehabilitating and training horses. Dr. Bojko enjoys all aspects of veterinary medicine with her main interests being reproduction, preventative medicine, and internal medicine. In her spare time, she enjoys traveling, hiking, riding Dressage with her Paint Horse Madonna, and trail riding with her Paint Horses Star and Ziggy. We at AE are thrilled to introduce Dr Lauren Powell, our 2018-2019 Veterinary Intern! An equine veterinary internship is a one year, post graduation position where the new graduate gains hands-on experience and valuable skills under the supervision of her mentors. Dr. Powell grew up in Western Upstate New York on a small family farm. She has participated in 4-H and FFA her entire life, from showing horses to livestock judging to dog obedience. Dr. Powell attended the University of Vermont for her undergraduate studies and Oklahoma State University for veterinary school. She graduated in May 2018. Dr Powell has special interests in reproduction, chiropractic, and acupuncture. In her spare time, she loves to hike with her dog, Freckles.